Pastel-filled workshops, crafts, games, activities, and circle time suggestions just in time for Easter. Create a special wall covered in pastel colors for the duration of your theme. 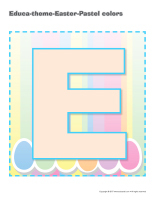 (Open educa-theme-Easter-Pastel colors) Print, cut out, and laminate. Use the items to decorate your wall and daycare to set the mood for the theme. 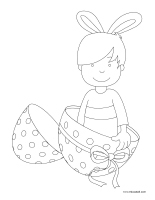 Draw and cut out an oversized pastel Easter basket. Display it on a wall, below the banner announcing your theme. Invite parents to help you decorate your pastel wall. 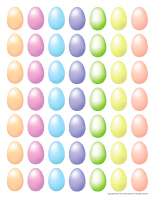 (Open memos-Easter-Pastel colors) Print several copies and set them near your daycare entrance. Parents can use them to write messages for their child. These memos will make great additions to your pastel wall. You may also encourage children to tell you kind words they would like to offer their friends. A few suggestions: nice, kind, happy, joyful, friendly, adorable, pretty, cute, charming, sweet, great, respectful, smart, thoughtful, caring, beautiful, fun, funny, etc. As children arrive, apply light pink makeup to their cheeks and serve them a pastel fruit cocktail they can drink through a pastel drinking straw. Wear pastel clothing items, hats, and scarves throughout the week. 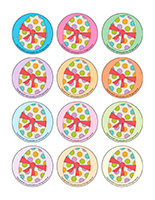 (Open educa-chat-Easter-Pastel colors) Print the questions, laminate them and deposit them in a box. Children can take turns picking a question out of the box. Print the "It's my turn" card. Laminate it and glue a Popsicle stick behind it. It will help children respect the child who is speaking. If you prefer, use your Poni puppet or another puppet children are familiar with. Obviously, this list of questions is far from complete. Feel free to add to it. What color do we create when we mix red and white paint? What is another name for "light orange"? If we mix green and white paint together, what color will appear? If we mix red, blue, and white paint together, what color will we see? We are a special type of crayon, what are we called? Can you name a type of pastel painting? Lighter shades of different colors are associated with which celebration? What often lines the bottom of Easter baskets? What do we call the "container" that holds chocolate Easter eggs? Besides chocolate, what can we give or receive as an Easter gift? These questions will help children develop their observation skills, their vocabulary, their thoughts, their ability to cooperate and respect the child who is speaking, etc. They will also help you enjoy circle time and explore your theme. 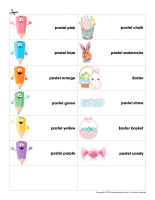 (Open educa-theme-Easter-Pastel colors) Print and laminate the items representing the theme. Use them to present your theme to the children in your group (and their parents) while decorating your daycare. 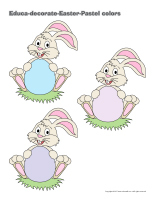 (Open stickers-Easter-Pastel colors) Print the illustrations on adhesive paper and use them to create a collection of stickers that can be used to reward children. Have children draw or cut out Easter items. They can use pastel clothespins to hang them on a clothesline hung within your daycare. This activity can last all week long. Use different lengths of string to hang Easter-related or pastel items and pictures from the ceiling within your daycare. 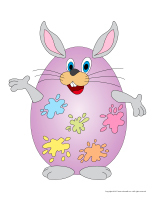 (Open educa-decorate-Easter-Pastel colors) Print, cut out, and laminate. Decorate your walls and hang decorations from the ceiling to set the mood for the theme. (Open perpetual calendar-Easter Break) Print and display to remind parents of the dates your daycare will be closed for Easter Break. (Open poster-Have a wonderful Easter Break) Print and display. (Open countdown-Easter) Print and laminate. 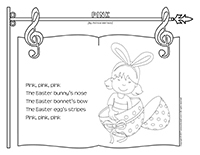 If you use the black and white version, children can color a picture each day until Easter. The pictures may be used as a memory game or to spark a conversation with your group. Use them to decorate the daycare or a specific thematic corner. 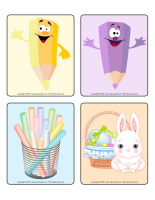 (Open picture game - Easter-Pastel colors) Print, laminate, and store in a "Ziploc" bag or in your thematic bins. 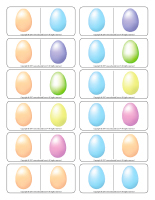 (Open activity sheets-Easter-Pastel colors) Print and follow instructions. 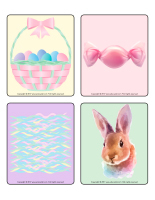 (Open stationery-Easter-Pastel colors) Print. The stationery may be used to communicate with parents, in your reading and writing area, or to identify your thematic bins. (Open educa-nuudles-Easter-Pastel colors) Print for each child. Have children color the sheet and use Magic Nuudles to transform the drawing and give it a three-dimensional look. Variation: You do not have Magic Nuudles? Simply ask children to fill the spaces with bingo markers or stickers. To purchase Magic Nuudles. (Open Easter workshops) Print. 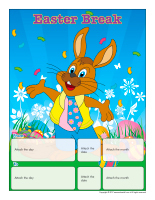 Use the posters to identify your various workshops during your Easter theme. (Open workshop planning booklet-Easter) Print, laminate, and use with a dry-erase marker so you can reuse the booklet year after year. This tool will help you plan and prepare any material you will need for each workshop you wish to offer as well as organize your environment per the interests of the children in your group. Use it to evaluate the activities presented daily and weekly. (Open workshop follow-up booklet-Easter) Print for each child. This booklet will help you better understand and analyze the developmental stages of the children in your group through the workshops you choose to offer. Squares of pastel felt that can be added to children's constructions. Sort toy cars, figurines, blocks, etc. by color. Use paint to explore color combinations. Pastel construction paper, tissue paper, cellophane paper, etc. for cutting, drawing, and creating. Markers with different types of tips (broad, thin, etc.) for exploring colors even further. Easel and paint palette to paint like real artists. Paint with water activity booklets. Abstract sculptures made with recycled materials. Toothbrush or sponge painting on a large piece of white paper displayed on a wall. Coloring pages that represent different art forms. Stencils for drawing various shapes. Waxed crayons, wooden colored pencils, markers, charcoal, etc. Transform your area to represent a "paint shop". Children will enjoy pretending they are painters. o	Pastel paint chips or samples, paintbrushes, paint rollers, painter caps, wooden stir sticks, etc. o	Decorating magazines (ask parents if they have some they no longer need). o	Old t-shirts with paint stains. Create an "artist" area complete with an easel and paint palettes. Add paper and make room for children's creativity. Memory game involving pastel colors. Pastel modeling dough. Use homemade dough and let children combine colors. Association game involving pictures and colors (ex. a picture of an orange and the color orange, a picture of a banana and the color yellow, etc.). Sorting games involving items available within your daycare. Colourful cellophane paper that can be manipulated to add a touch of color to various items. Glue pieces to the ends of empty toilet paper rolls and have fun observing objects. •	A Lite-Brite game or mosaics. Books about shapes and colors or simply books involving pastel colors. Homemade Twister game involving pastel colors. Water table: add a few drops of food coloring to the water. Rock bin: Use aquarium pebbles to create a colourful bin. o	The flower that changes color when we add food coloring to the water. o	Baking a cake and spreading pastel frosting on it. (Open word flashcards-Easter-Pastel colors) (Open giant word flashcards-Easter-Pastel colors) Print and laminate the word flashcards. Have each child pick a flashcard. They can take turns presenting their flashcard to the group (ex. pastel chalk). As a group, discuss each item. Ask children questions to encourage them to speak. (Open word flashcards-Easter-Pastel colors) (Open giant word flashcards-Easter-Pastel colors) Print the word flashcards and encourage children to use Scrabble tiles to recreate the words, using the flashcards as models. Manipulating the small tiles represents a great fine motor skills activity. What's more, children will learn to recognize the letters that make up the different words. (Open word flashcards-Easter-Pastel colors) (Open giant word flashcards-Easter-Pastel colors) Print several word flashcards. Use a hole-punch to make a hole at the top of each flashcard. Thread a ribbon through each hole and tie a knot. Bring the word flashcards outside and encourage children to use them to decorate a tree. Every time a child adds a flashcard, invite him/her to "read" the corresponding word. Children will be happy to repeat this activity many times. Eventually, they will learn to recognize the words. (Open word flashcards-Easter-Pastel colors) (Open giant word flashcards-Easter-Pastel colors) Print two copies of several word flashcards. Hang one copy of each word on an indoor clothesline with colourful clothespins. Arrange the copies in a pile on a table. Let children take turns picking a word and finding the matching word on the clothesline. When they find a match, they can place the flashcard on top of the one that was already hanging on the clothesline. Help younger children manipulate the clothespins if necessary. (Open word flashcards-Easter-Pastel colors) (Open giant word flashcards-Easter-Pastel colors) Print several word flashcards and hide them throughout your daycare or yard. Divide your group into two teams. When you give them the signal, children must search for the flashcards for a pre-determined period, for example three minutes. When the time is up, children must be able to "read" their flashcards to earn a point for their team. If they are unable to find the correct word, the other team can earn the point if its members succeed. 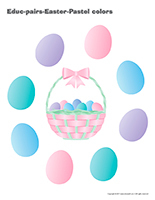 (Open scene-Easter-Pastel colors) Print, laminate, and cut out the various pieces. Children can use them to create various scenes. 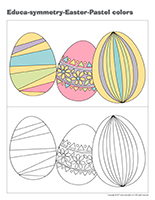 (Open transition games-Easter-Pastel colors) Print each illustration twice. Use adhesive paper to secure one copy of each illustration on the table. Deposit the second copy of each illustration in an opaque bag and invite children to pick a card that will determine their spot at the table (corresponding illustration). 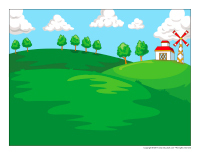 The illustrations can also be used to determine children's naptime spots or their place in the task train. (Open transition games-Easter-Pastel colors) Print, laminate, and use adhesive paper to stick the illustrations on the floor, creating a path that leads to various areas frequently visited by the children in your group (bathroom, cloakroom, etc.). If you prefer, you can also use the illustrations to delimit workshops or corners within your daycare. 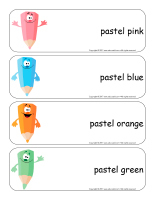 The educatall team suggests you plan a special pastel week for your group. Here are several activities you can adapt and explore as you see fit. 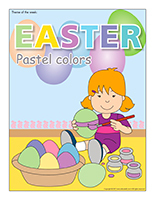 (Open educ-trace-Easter-Pastel colors) Print for each child. Children must trace the lines using a crayon of the corresponding color and then color the item at the end of each line using the same color. (Educa-symmetry-Easter-Pastel colors) Print. Children must color the picture on the bottom to make it look exactly like the picture on the top. (Open educ-pairs-Easter-Pastel colors) Print. Children must draw a line between items that go together or color them using the same color. 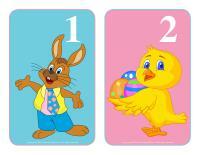 (Open color by number-Easter-Pastel colors) Print for each child. Children must color the picture per the color code. (Open word flashcards-Easter-Pastel colors) (Open giant word flashcards-Easter-Pastel colors) Print several word flashcards. Cut them out and glue each one on a piece of paper. Laminate them. Arrange the words in a binder and provide a dry-erase marker children can use to trace the words. Older children will enjoy trying to write the words independently below the flashcards. Set a variety of pastel items on a table. Invite children to observe them for a few minutes, then cover them with a blanket. Hide one or two items. Remove the blanket and ask children to identify the missing item(s). (Open dominoes-Easter-Pastel colors) Print, glue on cardboard, laminate, and cut out the cards. This game is for two to four players. Each child picks five cards. Arrange the remaining cards in a pile and set it in the middle of the table. Place one card face up in the centre of the table. The first player must try to match an illustration to one of the items already showing on the table. He then places it so the matching illustrations are touching. If he doesn't have a matching item, he must pick an additional card from the stack. If he still does not have a matching item, his turn is over. The first player who empties his hands wins the game. Write numbers 1, 2, and 3 three times each in the sections of an empty egg carton. Color the remaining sections using pastel colors. Have children set a button inside the egg carton before closing the lid. They may take turns shaking the box and then opening it to see where the button has landed. If it is in on a number, children must name the corresponding number. If the button lands in a pastel section, they must name the color. Ask around to find a pastel bedsheet. Invite children to gather around it and set a variety of pastel items on the bedsheet. With your group, vigorously shake the bedsheet to send the pastel items flying. If you are unable to find a pastel bedsheet, simply use your parachute. Variations: Use fabric flower petals, crumpled pieces of tissue paper, inflated party balloons, or hearts cut out of construction paper. This activity may also be done outside on a sunny day. Inflate four or five pastel balloons. Tell children the balloons must never touch the floor. With older children, you may ask them to never touch the balls with their hands, to blow on them, etc. Hide several pastel construction paper shapes throughout your daycare. Show children an example of what they need to search for. If you wish, you may have children collect them one category at a time, for example, they may collect only the heart-shaped ones or only the pastel blue shapes. (Open miniature pastel eggs) Cut egg shapes out of pastel construction paper or cardboard. Attach a paperclip to each egg and give children a fishing rod with a magnet attached to the end of it. Let them try to "catch" the pastel eggs. Fill a kiddie pool or large plastic bin with snow and hide pastel objects in it. When you give the signal, children must search for the items. Every time a child finds an object, he must deposit it in another bin before going back to search for more. Once all the items have been found, repeat the activity. Cut several different shapes out of pastel construction paper and arrange them on the floor (or in your yard). Play soft, gentle music and invite children to slowly move around the daycare or yard to the sound of the music. Every time you stop the music, they must quickly find a pastel shape to stand on. Divide your group into two teams. Have each team sit at a table with a single piece of paper and a pastel crayon. Play music. Each team member will have one song to draw anything he or she wants. When the music stops, the next child continues his team's drawing and so on. Display children's artwork. (Open miniature pastel eggs) Print and laminate. Hide the pastel eggs throughout your daycare and ask children to hunt for them. The child who finds the most eggs can hide them for the next round. 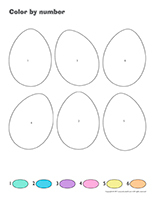 (Open models-Pastel eggs) Print and cut out several eggs. Cut each one in half. Stick one half of each egg on a wall or on your bulletin board. Hide the other halves. Children search for the missing pieces and associate each one to the corresponding egg on the wall. 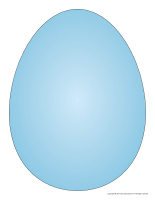 (Open models-Pastel eggs) Hide the eggs in your yard and invite children to search for them. During naptime, hide chocolate Easter eggs in plastic eggs for a fun (and yummy) activity and snack when children wake up. (Open pastel color wheel) Print and cut out the various parts. Glue the wheel on a paper plate. Make a tiny hole in the centre and use a fastener to attach the arrows in the centre of the wheel. To use the pastel color wheel with your group, place the small arrow on a primary color and the large arrow on the white section. 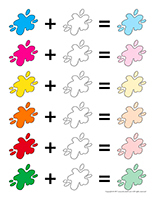 Mix the corresponding poster paint colors together with your group to create a pastel color. Using poster paint, show children how they can create pink paint. Of course, they simply have to mix white and red paint together. You may also invite them to mix red and blue paint together to create purple paint. Let children explore a variety of color combinations by providing small cups containing different paint colors, paintbrushes and paper. Prepare any flavor of red Jell-O. Once it is set, deposit small portions of the red Jell-O in Ziploc bags. Add a spoonful of whipped cream to each bag. Give each child a bag. They will enjoy manipulating the bag and watching its contents turn pink. There are so many Easter crafts involving pastel colors. Here are a few suggestions. Do not hesitate to use your own ideas and adapt our crafts to suit the abilities and interests of the children in your group. (Open models-Pastel eggs) Print and decorate the shapes with pastel glitter, ribbon, cotton balls, and confetti. Glue the items back to back, on either side of different lengths of ribbon or string. Hang the mobile from the ceiling within your daycare or above your changing table. Trace an Easter shape on white cardboard for each child. Have them apply white glue all over their shape. They can decorate their Easter shape with crumpled pieces of pastel tissue paper. Cut Easter egg outlines out of pastel construction paper. Cut a slit at the bottom of each egg and insert a drinking straw. Children will love using the straws at snack time. Make special glasses children can wear to see pink everywhere. Use two small Minigo containers and cut a hole in the bottom of each one. Glue pink cellophane paper on the bottom of each container. Make two tiny holes in each container, one on each side, and insert pipe cleaners in the outer holes for the stems of your glasses. Insert another shorter pipe cleaner in the remaining holes to tie the containers together and create the bridge for the nose. Set a large piece of adhesive paper on a table and encourage children to stick different types of pink paper (tissue paper, cellophane, construction paper, etc.) all over it. When they are done, set a second piece of adhesive paper on top of the first and display their pink stained glass in a window. (Open puppets-Easter-Pastel colors) Print the models on heavy paper. Have children cut them out and decorate them with a variety of arts & crafts materials. Stick a Popsicle stick behind each one to complete your puppets. (Open models-Pastel eggs) Print the models. Use them for your various activities and creations throughout the theme. Have children color all over a piece of waxed paper with pastel waxed crayons. When they are done, have them paint over the color with black paint. Set their work aside to dry. Once the paint is completely dry, encourage them to scratch the black paint to see the pretty colors reappear. Give children old shirts they can wear to represent paint smocks. Hang large pieces of paper on a wall and set an old bed sheet on the floor, under them. Let children paint using different paintbrushes and paint colors. Provide several smaller paint jars and let them explore various color combinations on their very own paint palettes. For each child, cut a paint palette shape out of a Styrofoam meat tray. Cut a tiny hole through which they can insert their finger. (Open pastel color combinations) Print, laminate, and display. Provide glasses of water, food coloring, and tiny spoons. Let children explore different color combinations. Provide a large quantity of pastel modeling dough. Set it in the centre of the table and invite children to use it to create collective sculptures. 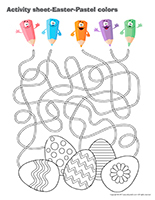 (Open coloring pages theme-Easter-Pastel colors) Print for each child.